Most people are relatively familiar with basic financial instruments such as stocks and bonds, but are less acquainted with another class of investments called derivatives. Derivatives are financial products whose price is derived from price of another underlying financial instrument, such as a stock or bond. Options are one type of derivative that is most popular among investors. An option gives investors the option, but not the obligation, to buy or sell something at a predetermined price and date. Below, we have prepared a simple explanation different kinds of options and how they could be helpful to savvy investors. An option that gives an investor the right to buy something is known as a call option, whereas an option that gives its holder the right to sell is known as a put option. Both types come with a number of terminologies that may sound somewhat complex. Here are some very simple explanations for each of them. Expiration Date: the last day on which you can exercise your option. Typically, when an investor buys an options contract on a stock, it is for 100 shares of the underlying stock. In our examples below, however, we assume that an option is for one share of the underlying stock for simplicity. For example, let’s assume you bought a call option to purchase a stock of Company A. The exercise price for the option is S$55, the premium is S$5 and the expiration date is one month from now. In plain terms, this would mean that you pay S$5 upfront to buy the option. If you do not to exercise the option, you won’t get this S$5 back. 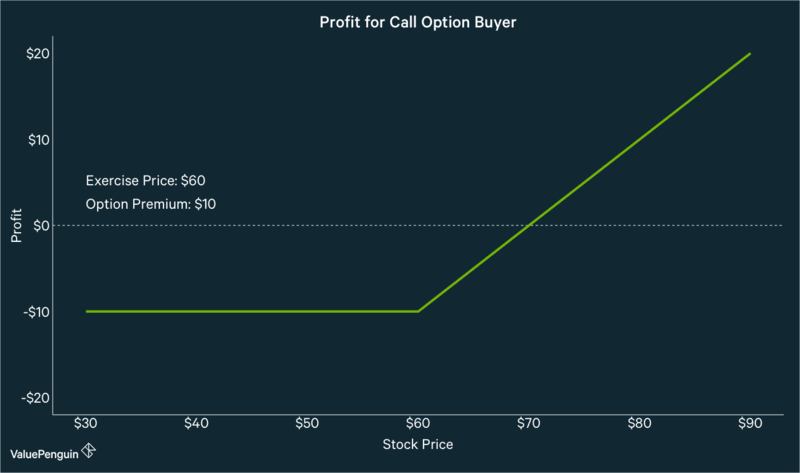 Typically, you can only exercise a call option if the stock price is at or above your exercise price. If the stock is worth S$60 today, you can exercise the option to buy the stock for S$55, and you would’ve broken even (S$5 premium + S$55 exercise price – S$60 stock price = S$0). Other terms that you will frequently hear when discussing options are in the money, out of the money and at the money. Options are said to be in the money when they have a positive payoff for the holder, meaning that the value of the option is greater than $0, and out of the money when they have a negative payoff. When an option produces a $0 payoff, it is said to be at the money. For example, our example above would represent an option that would be in the money because the call option had an exercise price of S$55 while the underlying stock was worth S$60. Two other terms you’ll hear when discussing options and stocks are long and short. When you buy a security, you are said to be long; selling a security would mean that you are short that security. Lastly, options usually come in two varieties: American and European options. American options allow the holder exercise the option on or before the expiration date, while European options only allow the holder to exercise the option on the expiration date. As mentioned above, a call option gives its holder the right to buy a financial asset at a predetermined price by a predetermined date. Investors can both buy and sell (or “write”) an option. Let’s go back to our example of Company A. However, this time the strike price is S$60, the premium is S$10 and the expiration date is one month from today. Soon after buying the option, Company A’s stock rises to S$75 and you decide to exercise the option. Since the call option is “in the money,” you can pay S$60 to buy a stock that is worth S$75, earning you S$15 of profit. After subtracting the premium you had to initially pay (S$10), your total profit comes to S$5. What if the stock declines in value? If Company A’s stock declines to S$50 per share, you will not be able to exercise the call option because it is “out of the money.” After all, you won’t want to spend S$60 to buy something that you can get for S$50. In this case, you will have lost S$10 that you initially paid in premium. Our graph below demonstrates the payoff of this call option depending on how the stock price behaves. You can also sell (or write) a call option. This means is that you are selling someone a call option, or a right to buy a certain stock at a certain price. For instance, you could write a call option for Company A, with an exercise price of S$60, a premium of S$10 and an expiration date one month from now. On the expiration date, Company A’s stock has declined to S$45 per share. Your buyer will not exercise the option since the option is out of the money. Therefore, you can pocket a profit of S$10 from the premium you charged initially. However, as a writer of a call option, you have an unlimited downside if the stock increases in value. If Company A’s stock goes up to S$80 per share, then the call option will be in the money. If your buyer exercises the stock, you will have to buy the stock for S$80 and sell it for S$60 to the buyer, which nets you S$10 of loss. This loss can increase infinitely as long as the stock price continues to increase. In the graph above, we can see that the call option writer turns a profit only when the stock price is below the exercise price plus the premium charged (S$70 in this case). A put option gives its holder the right, or option, to sell a financial asset at a predetermined price and date. Like a call option, an investor can either buy or write a put option. Consider an example where you are buying a put option for Company B with an exercise price of S$45, a premium of S$15 and an expiration date one month away. Company B stock drops to S$25 a share the following week. In this case, exercising your option will yield a profit of S$5 because you can buy a stock for S$25 and use your option to sell it at S$45 (S45-S$25-S$15=S$5). If the price of the stock increased instead, then it wouldn’t make sense to exercise the option. For instance, if the stock price increased to $55, then you wouldn’t want to sell the stock for $45. In this situation, your loss is limited at S$15. 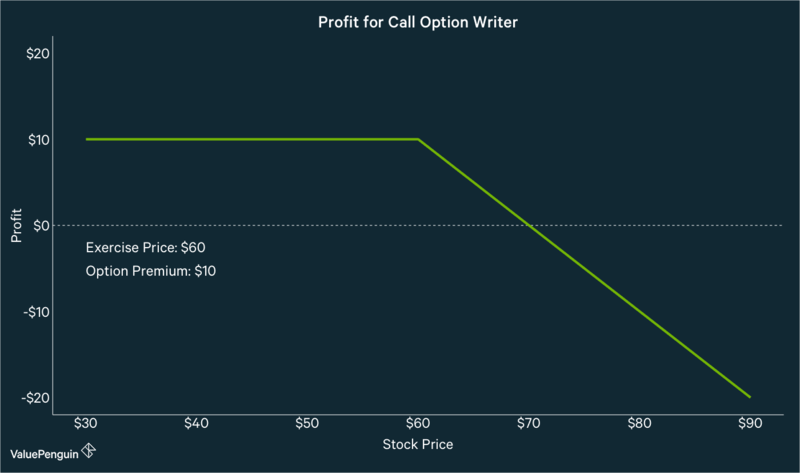 Just like a call option, you can also write a put option. Let’s assume you sell a put option for Company B for a premium of S$15, strike price of S$45 and an expiration in one month. 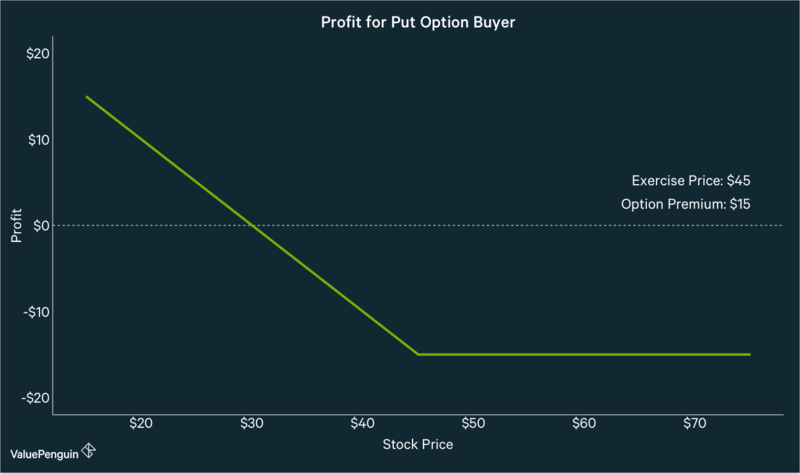 If the price of the stock increases to $50, you will generate a profit on the put option because the buyer cannot exercise the option to sell since it’s out of the money. Therefore, you get to keep the S$15 of premium you charged to sell the option initially. If the price of IBM stock declines, however, your potential loss is again large. Let’s say the underlying stock declines to S$30 per share. Since this is S$15 below the exercise price, you would lose total of S$15 minus the S$15 of premium you charged, which nets out to S$0. If the stock price fell even further, you would have a loss as the premium would not be enough to offset the difference between the stock price and the exercise price. When buying an option, an investor will have to consider a different number of factors including 1) how the underlying stock price will behave, 2) duration of the option and 3) premium of the option. Below is a simplified version of how options contracts appear normally. Generally, longer maturity of an option will result in higher premium. Because there are so many things that could happen between now and the future, the writer of options demand a higher premium to take on that risk. It’s much easier for a stock to move from S$100 to S$500 over 5 years than in 10 days. Also, a bigger gap between the strike price and current stock price will impact the premium you pay. For example, if you want to buy a call option for a stock that is currently at S$50, it’ll be more expensive to buy an option with a strike price of S$51 than to buy one with a strike price of S$60. When strike price is so close to underlying stock’s price, it’s easier to make money on the option, and hence the seller will demand a higher premium. Finally, to pick an option that has the potential to turn a profit, an investor needs to assess the value of an option according to her belief of whether the price of the underlying asset will go up or down. This means understanding how to calculate the profit of an option and also understanding how time until the expiration date affects the value of an option. One of the main reasons investors use options is to control risks of their investments. Owning an option on a stock presents a very different set of risks and returns than simply owning or shorting a stock. For instance, buying a call option gives you a higher upside on a stock if the stock goes up, and also a limited downside: you can only lose the premium you paid on a call option. However, your loss is also definite unless your stock goes up, while owning a stock does not results in a loss even if the stock price doesn’t move at all. For example, let’s assume you buy a stock at S$40 and its call option for a premium of S$5 and strike price of S$45. If the stock declines to S$20, stock will lose 50% of its value, while you will only lose S$5 premium you initially paid for the call option (100%). On the other hand, if the stock rises to S$60, your stock will have risen 50% in value while your call option would have earned S$20 on your S$5 of investment, a net return of 300% (net profit is S$15 on S$5 investment). Options can be combined with each other or other investments to further change the associated risks and returns. For example, an investor might purchase a share of a stock and also a put option on this stock in a strategy known as a protective put. As the name implies, a protective put is a strategy used to “hedge” or protect against the risk of the stock price declining substantially. Another strategy, called a straddle, occurs when an investor buys a call and a put option on the same stock. In this case, an investor believes that a stock will move up or down by a great deal, but is unsure of which direction. They are essentially making a bet that the stock will be subject to a lot of volatility. These are just a couple of the ways that options can be combined to create more complex investing strategies.